Shopping for DC Comics Dolls? Fashions include elements from original DC Comics Super Heroes while accessories highlight the characters super powers. Articulation allows for lots of action and super hero poses. The Wonder Woman action doll is positively Amazonian! She wears a fabulous outfit of red, white and blue, stars on her pants, and signature armor. The natural leader and top athlete sports her Lasso of Truth, Super Hero wrist cuffs, and tiara. Designed with high articulation and the ability to stand alone, the Wonder Woman action doll is ready for powerful posing and creative storytelling. The Batgirl action doll can push the limits! She wears a fabulous outfit; Batgirl symbols on her shirt and bat-inspired mask and hood ready for action fashion. The tech genius and expert detective comes with her bat-shaped backpack, phone gadget and utility belt. The Supergirl action doll is super heroic! The most powerful teen in the universe, she has powers of flight, amazing strength and x-ray vision. She wears a fabulous outfit of red, blue, and the Supergirl S-shield logo. The sweet optimist has her signature red cape, molded for flight. Designed with high articulation and the ability to stand alone, the Supergirl action doll is ready for powerful posing and creative storytelling. 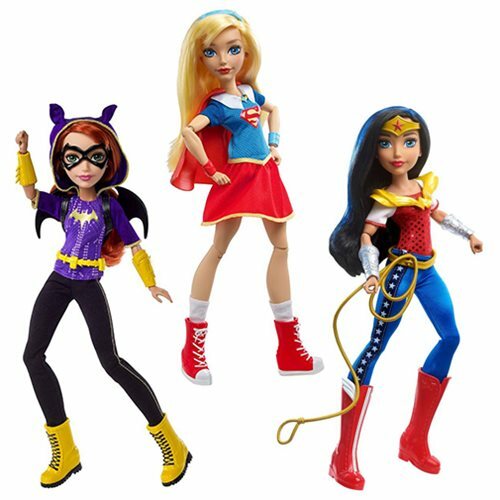 Superhero Dolls From DC/Mattel Team Up Here to Save the Day!